HALF MOON BAY, CALIFORNIA - Northrop Aviation's tailless "Flying Wing" experimental aircraft, a bone-chilling assortment of dragsters, funny cars, gassers, and jet cars, a regionally sanctioned Tractor/Truck Pulling competition, and the world's most whimsical showcase of 2,000 driving, flying, and working machines highlight the Pacific Coast Dream Machines Show, Sunday, April 29, 2001 from 10 a.m. to 4 p.m. at Half Moon Bay Airport. The giant eleventh annual show, which benefits the Coastside Adult Day Health Center in Half Moon Bay, celebrates one hundred years of mechanical ingenuity, power, and style with a remarkable exhibit of whirring, hissing, and roaring machines running the gamut from classic cars, U.S. Army tanks, and antique motorcycles, to restored military aircraft, model-T fire engines, massive steam tractors, and tons more. Automobile enthusiasts will get a rare up-close look at motor vehicles from every era in the 20th and into the 21st century. 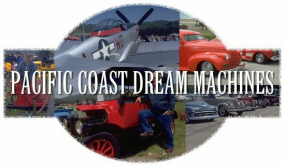 Antique, vintage and classic cars will represent the early days with horseless carriages and Ford Model T's, among others, alongside the more fanciful touring and luxury cars like the Bentley, Packard, and Rolls Royce. Flash and speed will be symbolized by an array of fabulous sports cars like the T-Bird, Jaguar, Cobra, Triumph, and Model-T roadster. A strong field of custom street rods will showcase their gaudiness and amazing detail work, while muscle cars like the 'Cuda, Mustang, GTO, and Camaro will flaunt their machismo and power. And an awesome collection of race cars will be displayed, many firing-up their engines throughout the day. There will be no racing. The featured aircraft display will be the Northrop N9M "Flying Wing" owned by the Planes of Fame Museum in Chino, California. Originally designed as flying scale models of the larger flying wing, the B-35 Bomber, it is the only surviving "Flying Wing" of the four that were built in 1942. The N9M's were one-third scale flying test beds of the larger bomber, designed to test theories of stability, control, and maneuverability. The aircraft's most peculiar characteristic is its tailless design. Giving a whole new twist to the phrase "flights of fancy" will be dozens of aviation wonders, ranging from stylish homebuilts to classics from the 40's and 50's to meticulously restored war birds. A spectacular display of military aircraft will feature a Yak-9 Russian fighter, a British-made Hawker Seafury Carrier-based fighter, several U.S. P-51 Mustang fighters, an F-86 jet -- the premier U.S. fighter in the Korean War, and lots more. Thrill seekers can satisfy their longing with a thrilling ride in a helicopter or Stearman bi-plane. The most curious and fascinating displays are the large and small engines collected and refurbished by members of the Early Days Gas Engine & Tractor Association. Their fascinating array of flywheel engines are enough to power old-fashioned washing machines, lawn mowers, and an entire Lilliputian factory. On the larger side is the farm and logging equipment. Among those hissing and churning away will be a 12,000-pound Russell steam traction engine used to thresh wheat and grains in Oregon, and a giant 60-horsepower steam powered Western engine used in the Coalinga oil fields. Rounding out the show will be a tractor/truck pull competition, kids amusements, food booths, and live music. Spectator admission is $10 for adults, $5 for ages 5-14 and 65+, and free for kids age 4 and under. Tickets are available at the gate only. Half Moon Bay Airport is located on Highway 1, about 20 miles south of San Francisco and 5 miles north of Highway 92. For information, call 650-726-2328 or visit the show web site at www.miramarevents.com. By Tim Beeman � AutoWire.Net  San Francisco.